The ATVS-NxT™ hot wire anemometer is a fully-portable scanner that provides rapid and highly precise temperature and air velocity measurements in electronic packages. 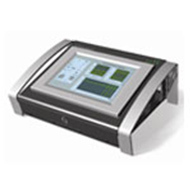 The ATVS-NxT™ scanner operates with an embedded PC, featuring touch screen control. It includes a 100GB solid state compact flash, 4 USBs and an option for 2.5" SATA HDD. Ethernet connection allows the ATVS-NxT™ to transfer data via network. The ATVS-NxT™ supports up to 32 sensors for simultaneous, single-point air velocity and temperature measurements in environments where single or multipoint measurements are required. The sensors are calibrated for both low (natural convection) and high velocity flow rates. The unique and patented sensors are designed to be flexible, robust and low profile to minimize flow disturbance. They can be easily placed anywhere in the test domain. The use of a single sensor to measure both temperature and velocity eliminates errors introduced as a result of the flow being non-isothermal.